OBJECTIVES: Laparoscopic adrenalectomy has become the standard of care for resection of adrenal masses, with extremely low morbidity and mortality. There have been no studies addressing complication rates in older patients to our knowledge. We are studying the difference in outcomes in patients who underwent laparoscopic adrenalectomy at Geisinger Medical Center, comparing patients 55 and older with patients less than 55 years-old. 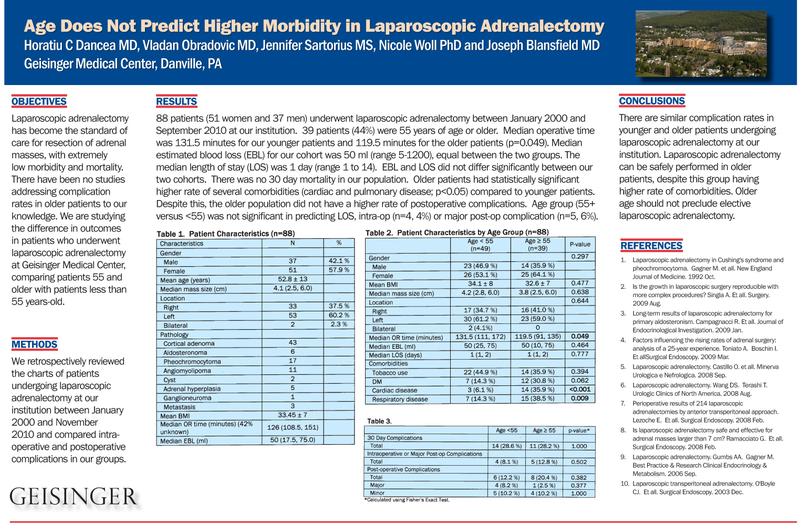 METHODS: We retrospectively reviewed the charts of patients undergoing laparoscopic adrenalectomy at our institution between January 2000 and September 2010 and compared intra-operative and postoperative complications in our groups. RESULTS: 88 patients (50 women and 38 men) underwent laparoscopic adrenalectomy between January 2000 and September 2010 at our institution. 39 patients (44%) were older than age 55. Median operative time was 136 minutes for our younger patients and 119 minutes for the older patients. Median estimated blood loss (EBL) for our cohort was 50 ml (range 5-1200), equal between the two groups. The median length of stay (LOS) was 2 days (range 1 to 14). Operative time, EBL and LOS did not differ significantly between our two cohorts. There was no 30 day mortality in our population. Older patients had statistically significant higher rate of comorbidities (diabetes, cardiac and pulmonary disease; p<0.05) compared to younger patients. Despite this, the older population did not have a higher rate of postoperative complications. Age group (55+ versus <55) was not significant in predicting LOS, intra-operative (n=4, 4%) or major post-operative complication (n=5, 6%). CONCLUSIONS: There are similar complication rates in younger and older patients undergoing laparoscopic adrenalectomy at our institution. Laparoscopic adrenalectomy can be safely performed in older patients, despite this group having higher rate of comorbidities. Older age should not preclude elective laparoscopic adrenalectomy.